Best way to mount amp?! I was wondering on the best way to mount an amp so that is is a clean look. I was thinking on mounting it between my two 6x9s...the amp is rather small, I ended up going with Kicker ZX200.4 it suited my needs much better. I can give 50 RMS to my backs by wiring those in parallel, and then my fronts can have a happy 35...only 10 more than they can handle...so it works out nice. I plan to include a sub-woofer in a few weeks to a month after my car passes inspection. Anyway, I can't figure out which would be the best way to mount the amp. (1)I was thinking either on my side walls of the trunk where the tire hump is. Wherever you put it, make sure it's within the 3 feet (or less) of a bolt for the ground cable so you can keep that clean look once it's all wired up. I was kind of thinking 6x9s area....but didn't know if that would be a safe bet? Don't know how hot it gets over there but, have you thought about mounting it in the vehicle? I had my amp in the trunk but after 3 different camping trips I relocated it underneath my passenger seat in my Focus. All wires run under the carpet so you wouldn't even know it's there! If you go in the 6x9 area, will you be putting anything between the amp+vehicle itself? I wouldn't want to bolt it directly to the vehicle...I don't know just wouldn't feel right. 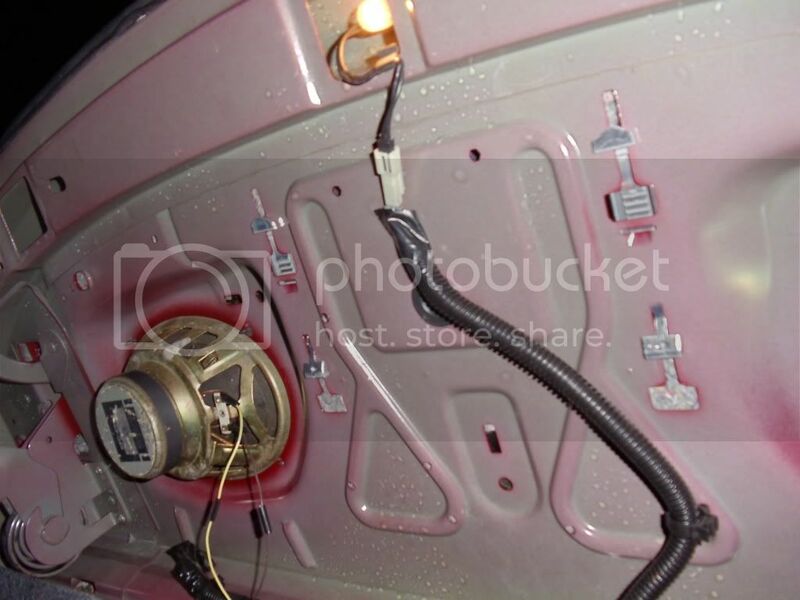 If I were you, I'd personally mount it on either the left or right side of the vehicle and keep the sub close to that side of the trunk cause I'd like to keep the speaker wire hidden as well (I used an extra MIT Terminator cable I had laying around). 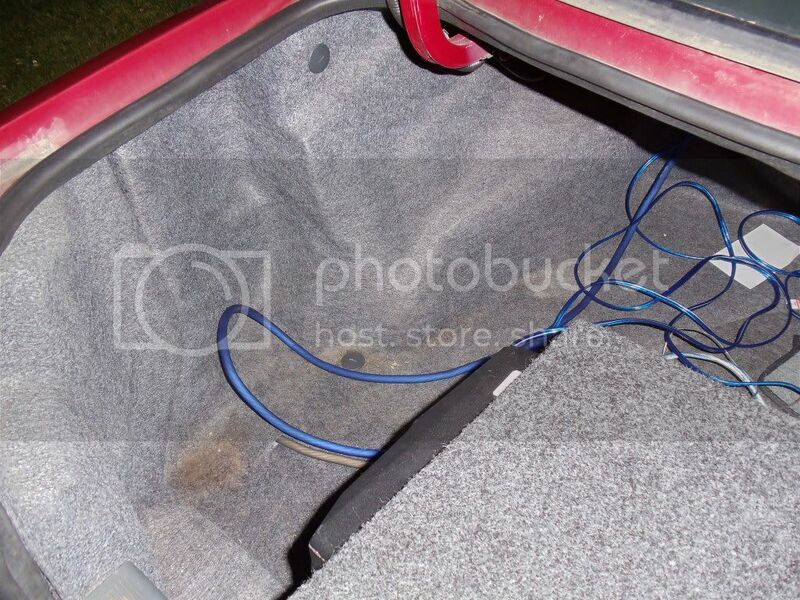 Hmmm....good call...I had not thought about that....I was just gunna screw the amp right there...I was going to use like tech flex to cover all the cables and like zip tie them to the top....as you can see there are seveal spots to zip tie to..
What would you suggest I put between the two? Also would I just screw the amp right into the wheel well? Should I put a board or something between it? Use like so sealing spacers or something? I have researched my amp, called kicker, and it turns out if I mounted it upside down...I would eventually fry my amp. I will post pics in the "Install thread or whatever"
Fry the amp huh? Didn't think you could do it by mounting it such a way, GOOD THING YOU CALLED! Yah, because of the heat sinks are, kicker said that the heat will radiate up and kind of make like a heat blanket that will linger around the components. Anyway, I just have to tidy up the cables, shorten the grounds at some points and it's good to go. I am a little suprised that while you were doing your research on an amp to choose, that you did not notice that they say to not mount the amp upside down due to buring up the amp alot faster. Also another thing about your amp is you do not want to mount it to your sub box either. The reason for this is; as you sub hits, your amp is going to get all that vibration, and thus after a while it will shake some of the interal workings lose, thus reducing the longevity of the amp. 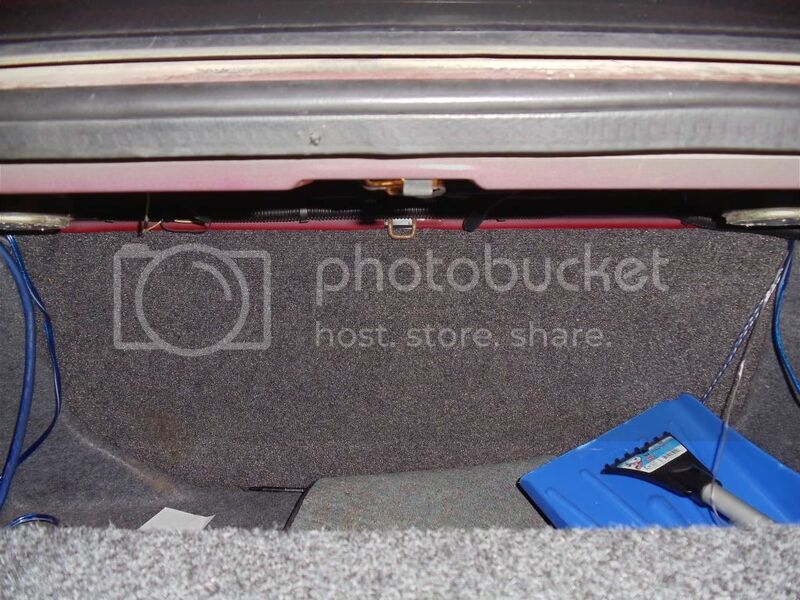 Do you have a spare tire in trunk under the carpet?? If you dont that is a good place to look at as well. If you are worried about the amp not getting enough ventilation you can always make a plate out of MDF to fit the hole, and put like a vent hole so that the heat can go somewhere other than where it is. Or better yet instead of cutting just a hole you could always cut out a hole to put like a computer fan there ( do not cover it up with sub box), and have it blowing the hot air up, and out. True. I bought some particleboard and will be placing that under the rug, kind of gluing it to the trunk perhaps. I plan on mounting both amps to the board, I do have a place where my spare tire is...but it is a mess down there lots of glue, and foam and some rust as well for some odd reason. Um, I plan on organizing the wires on the board I just have to draw up a diagram and saw the board out. I have to shorten my ground wires on account of a ground loop.... Hopefully shorter ground wires will help, if not I will need an ground loop filter. On top of that my receiver does not really put out the volts for a 4 channel amp I guess....it puts out 2v when I guess I need 4v or higher to get results? And because it only has one preamp and has to feed 2 amps....it loses power....Oh well...who knew? Anyway, I did have it on my sub-woofer box for awhile, but will be removing it shortly. And advice to keep the board secure without actually drilling it to the trunk? Uh...... I would have to say that not really, unless you find some really super bad glue. **** it down is probably the best way that I know of, but I am not expert. 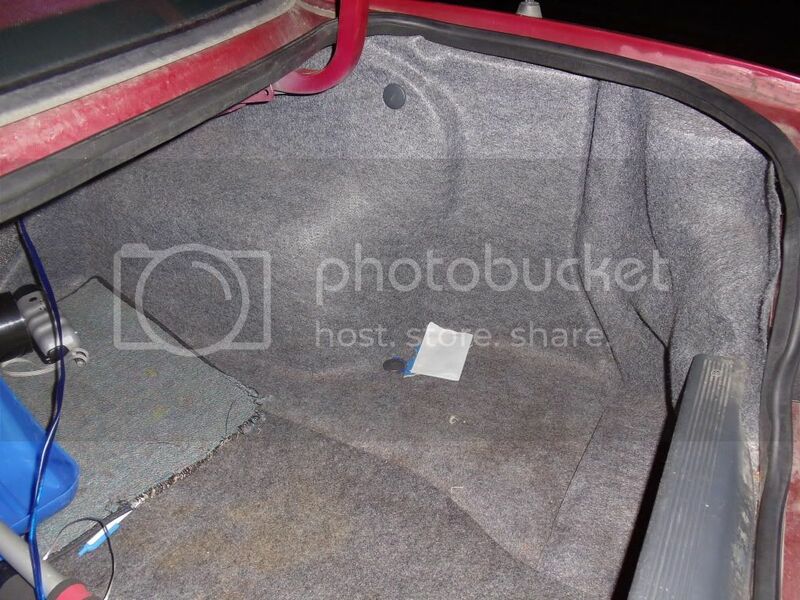 Whe I had a car, my back seat's folded down, and I placed each amp of mine across from each other, and was mounted on the back seat back rest. It worked out for me because, there was plastic under the carpet so, there was a little more for the screws to hold onto. As for your head unit you are going to want to get one that has a 6 channel RCA Front/Back/Sub outputs. Yes, you want to try to find a hu that is 4v if at all possible. If you look at the spec info it will tell you all you need to know about it. Partical borad should be fine. Me I like to use 1/4 MDF but that is just me, but partical borad is just fine as well. Someone please correct me if I am wrong, but you should be able to mount the amps on the side..?? Think about it for a moment, and take some cardboard, and make a template out of that first, then cut your partical borad. Best advise I can give is measure twice, cut once. Well, for my subwoofer amp mounting on the side is fine, since it has fins and such. My kicker, maybe...I plan on measuring quite meticulously. Although this is rather temporary just to last me until the summer until I can get a newer car, then I will go a bit more crazy on my custom work. If a few $4 boards can get me some organization, I will have at it. I plan on doing it tomorrow if all goes well...just a rough cut out will do. Nothing permanent. And stores around me don't sell MDF I guess....I asked around.